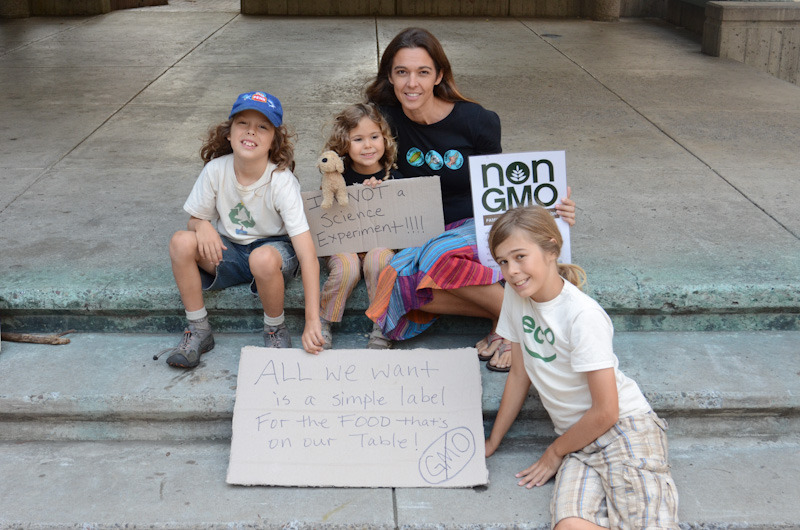 With over 75 actions worldwide this week to stand up against Monsanto and demand the right to know what is in our food, we knew we had to be a part with the Eco Womb family. With an Occupy Monsanto event scheduled in Ithaca, NY, where we just happened to be headed to meet up with friends, and with the help of the Genetic Crimes Unit team, we connected with Joanne, a local hydro-fracking activist. 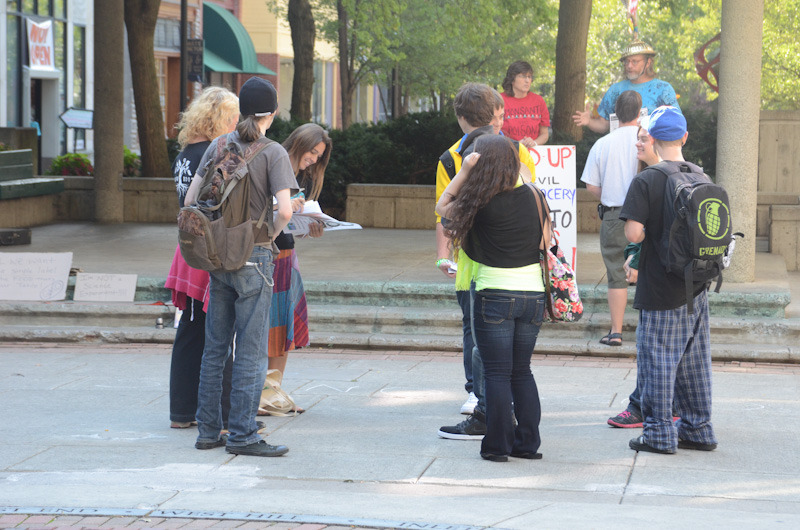 Together, with a handful of others who joined to stand with us throughout the day, we turned the Ithaca Commons into our educational ground from 12noon-5pm, connecting with hundreds on the importance of learning what is really in our foods, the dangers of GMOs, and why the government is not sharing this information. 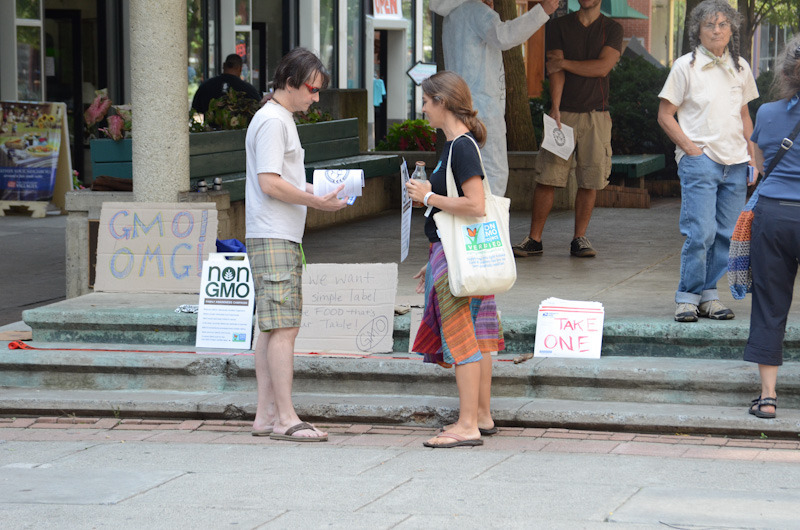 We handed out educational flyers from the Non-GMO Project to inform people on what a GMO is and what the detrimental effects are on farmers, our soil, and our health. We sang music to the tune of “All we want’s a simple label, for the food that’s on our table” carrying on the energy of the Right2Know March. 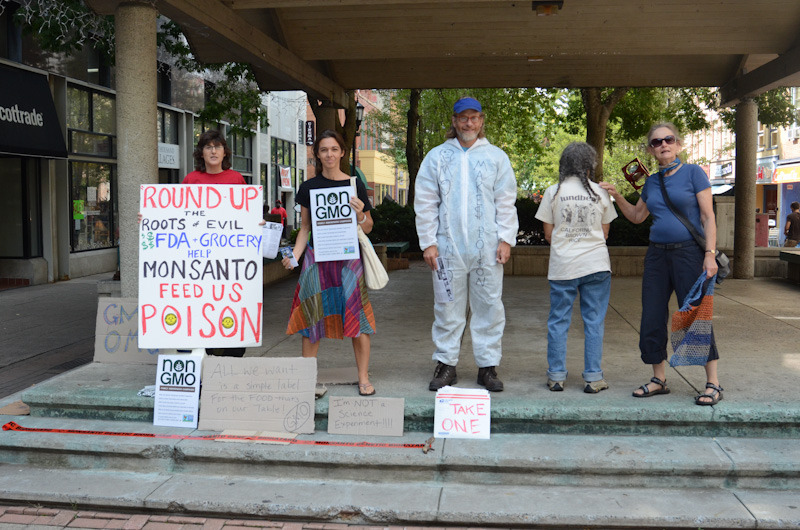 And, we aired The World According to Monsanto all day so that passer-bys could get a glance at the evils behind Monsanto, and learn the history and ties between Monsanto and the government. 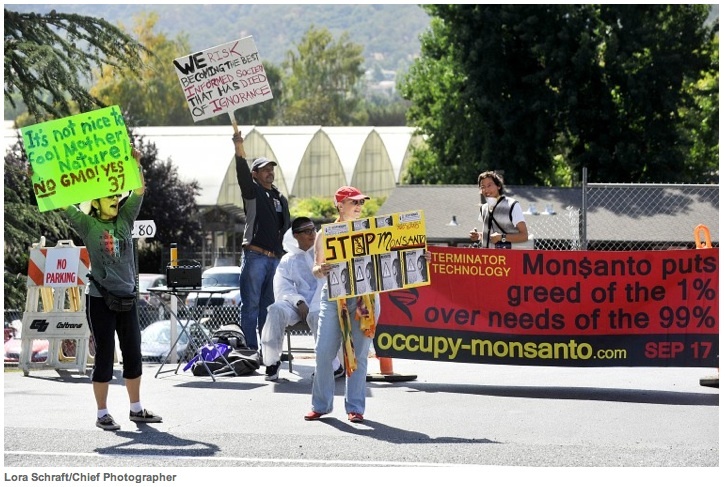 Monsanto is corrupt, and has built its fortunes as a chemical company. It claims to be a seed company, “a sustainable agriculture company” helping farmers by “improving agriculture, improving lives” – yeah right! Monsanto developed Agent Orange, PCB’s, RoundUp pesticides, and has continuously distributed false information on the level of toxicity in their products. They even claimed that dioxin was not cancerous, causing weaker environmental regulations based on falsified evidence! 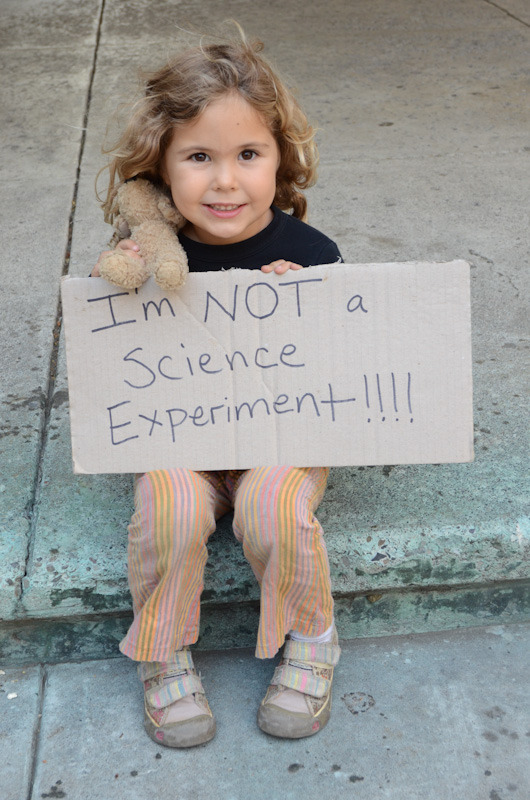 Now, they claim that Genetically Engineered seeds are safe – yeah right, again! We have been eating their foods since 1992 without anyone telling us, warning us, or letting us make the choice to not ingest their poisons. The health ramifications from GMOs are so huge, and with an increase in autoimmune diseases, allergies, ADD/ADHD, asthma, decreased fertility, and even cancer over the past decade, there is no question in my mind that the two correlate. 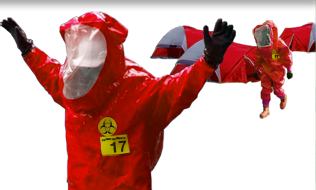 More toxins in our food, more toxins in our bloodstream, more diseases, as our bodies fight to adapt and try to keep up with all of the foreign elements we are ingesting. There have been studies that link GMOs with birth defects and cancerous tumors, and enough evidence to warrant at least restrictions or labeling laws. I personally think GMOs should be banned and Monsanto should go away! I mean why have they dumped billions of dollars into fighting against labeling with misinformation campaigns if they are so confident in their product? They want you to buy their frankenfoods. They want farmers to be dependent on them year after year. They want us to become sick ingesting their poisons and then have to circle back to the pharmaceuticals for medications to be even more dependent on drugs to prop us up. If they control the food supply, they control the people. Stop buying their products, they don’t control you anymore. If everyone did this, or enough of us did, and we voted with our forks and dollars, there would be change. And the only change that is going to happen is if they feel it in their pockets. 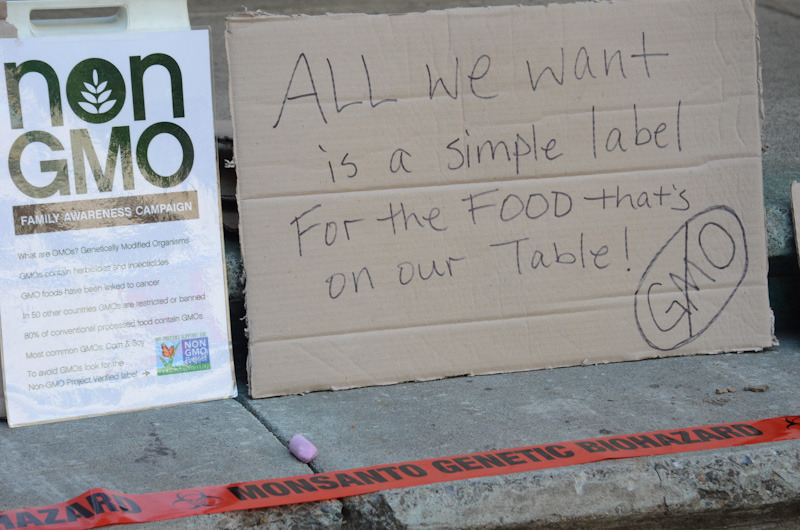 Did you know that Monsanto has a patent on GMO seeds? This means that they can sue farmers whose fields may become contaminated with GMOs through cross-pollination just by being near a GMO farm. GMO seeds also can’t be replanted the next year, they are a dead-end food source. Farmers are becoming dependent on Monsanto year after year to supply seeds, and the corporate giant can even step in and sue farmers for trying to replant. Farmers are supposed to save seeds and replant! That is how we have survived for the past millennium. 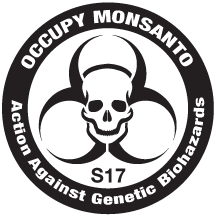 With 94% of soy, 90% of canola, and 88% of corn grown in the U.S. being genetically engineered, and the government subsidizing farmers to grow these crops, and Monsanto controlling the patents on all of these seeds, it is pretty obvious that they are making huge profits. They don’t want us to understand these connections, or the detrimental effects of GMOs. They don’t care about how sick GMOs make the population. They want this, and they must be stopped. That is why we marched 313 miles last fall with the Right2Know March to demand GMO labeling, that is why we Shopped for Truth at Trader Joe’s to uncover why they won’t label their brand, that is why our family has committed to shop exclusively Non-GMO, and that is why we are continuing to march and educate on the dangers of GMOs, so that we can reach as many people as we can to deliver this message. We are parents, our children NEED us to speak up. If we don’t, who will? We are truly the change we have been seeking. Our children are depending on us to wake up the world. And, it doesn’t have to mean conflict with the powers that be. Through peaceful non-violent protests, educational opportunities, and continuous connections with conscious souls along the way, we are collectively standing up and speaking out to create change one family at a time. So, what can you do? Take steps to eliminate GMOs from your diet. Choose one of the top contenders first, like corn, or soy, or canola oil. Check what is in your cabinets and read the ingredients. If it has these foods listed and does not have either a Non-GMO Project Verified or USDA Certified Organic label, or you know exactly what farm it came from and you understand what their practices are, then it most likely has GMO ingredients. You do have the power to affect change. Vote with your fork and your dollar. For every bite you take that is Non-GMO and every food that you buy that is Non-GMO, you are voting for change in the one way that makes a direct impact, it affects the profits of those in control. You can also support Proposition 37, the ballot initiative in California that would require GMO labeling, and candidates that support this initiative. You can continue to learn and understand the issue, help spread the word by sharing this information with your friends and family, and support those businesses, organizations, and educational efforts that are standing up and speaking out on behalf of us all. We CAN collectively make a difference. We finally are.